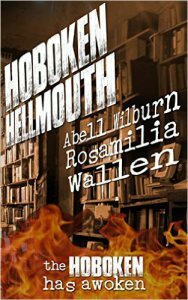 … or in the case of Hoboken Hellmouth, four authors couldn’t leave a story alone. Solomon, the hero and reigning Hellmouth, is back for another round of crazy supernatural shenanigans in the follow up to the wildly irreverent Hollywood Hellmouth. Why did Armand Rosamilia, Jay Wilburn, Jack Wallen, and myself return to the Hellmouth’s world to torture poor Solomon again? No seriously, why would we go back and bring a down-on-his-luck Solomon cross-country to Jersey of all places?